So you are new to Etherpad or contributing to Open source and you want to know how you can get started helping out the Etherpad foundation spread the goodness that is Etherpad. We’re always looking for new people to join our fellow Etherpadians, we have one motto of “Ask forgiveness not permission” so get started doing your thing and don’t be scared of doing something wrong. Here are some things we need help with..
Getting started: Draft a blog post and email it through, if we like it we will publish it on blog.etherpad.org. Alternatively self publish on your own blog and bump us and we will help promote it. If we’re comfortable after a few posts with you we will give you author access on blog.etherpad.org. Getting started: Scan Social networks for people chatting about Etherpad or Etherpad alternatives and engage with them to inform them of what they can/can’t use Etherpad for and how they can leverage Etherpad to improve their life, forever.. 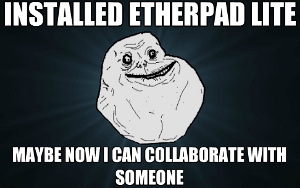 Create new conversations with the goal to enlighten people to how awesome Etherpad. Getting started: Hunt down people questions being asked about Etherpad and provide a clear answer to their question. Earn badges, free princesses. Getting started: Find open issues and try to replicate them on your own Etherpad instance. Update the issue to confirm the issue if the issue does exist. You may be asked by a code contributor to test a fix too, for this you may need basic git experience but it’s not required. Getting started: Review existing tutorial videos, find some ones we’re missing, create some video guides and upload them to your favorite video sharing website. We don’t have an official channel or anything fancy, feel free to make one! Getting started: Look at some example plugins and modify them to do what you want. Look at the open plugin requests on Github and the Etherpad feedback/voting platform. Once you are happy with your plugin publish it to npm and ask the mailing list for feedback. Getting started: Read the wiki articles and contributing guidelines first, then look through the open issues and submit pull requests for anything you can resolve. Getting started: Create some marketing material such as memes from the 90s, put it online and send it through to us and we will spam it about on social media and other places. Getting started: Find something that is missing a translation and add it on our translation page. Getting started: Install Etherpad locally and attack it, patch Etherpad Develop Branch and submit a pull request with a fix then let us know before going public as per a relatively sensible security disclosure policy. Knowledge required: Basic writing experience, some windows experience, basic Etherpad experience, git experience. Getting started: Create a release pull request following our release guide. Getting started: Contact us and when a general inquiry/request hits our inbox we will forward it through to you to forward through to the correct party.